I was determined not to leave Denmark without trying a smørrebrød, essentially an open faced sandwich made with dense dark rye bread and a variety of toppings. The restaurant I had planned on trying it at was filled by 1:30pm and wouldn’t be able to fit us in due to further reservations. So, we wandered down the street until Amadeus came into view. 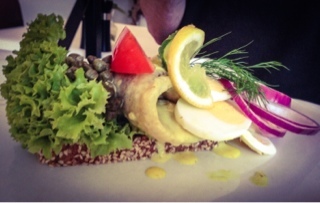 Their menu offered 14 types of smørrebrød, which all sounded like traditional offerings. However, Amadeus serves its purpose - if I was going to try the famed sandwich, it would be with herring and not fried chicken or braised beef anyways. All the smørrebrød were 69 DKK each, with successive discounts for additional pieces (without sharing amongst the table). The apple in my husband’s curry (karry) herring added a strange sweetness to the sauce that wasn’t particularly appetizing, but I did enjoy the slices of hard-boiled egg mixed with dill. Personally, I preferred the plain white herring (krydret) instead. At first scared it would taste fishier, the dill vinaigrette the fish was marinated in gave it a tart pickled taste to whisk away any seafood essence. 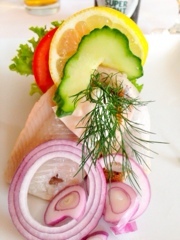 Moreover, there was plenty of dill, red onion and thick sour cream adorning the fish to add other flavours and textures. The crunch from the cucumber slices was rather nice against the softness of the fish, alas, there was only one piece of it. Overall, they were beautifully presented sandwiches, filled with colours and artistic structures. But, shamefully I’ll admit … I really would have liked a slice of juicy braised meat on it instead.